9 Skeins Schachenmayr Laluca Cotton Yarn "Baby Pink"
NEW 9 Skeins Schachenmayr Laluca Cotton Yarn. 50% Cotton 50% Acrylic. Color: Baby Pink. Schachenmayr SMC Frilly scarf yarn. color: Caribbean (# 00091). 97% acrylic 3% polyester. 3.5 oz (100 grams) 30 yards each. Schachenmayr Nomotta Microsport weight microfiber yarn. Color: Fern (# 00071) - light green. 1.75 oz (50 grams), 159 yards each. 100% microfiber acrylic. 3 Skeins Schachenmayr SMC Boston Yarn "#121 Neon Yellow #122 Neon Orange"
NEW 3 Skeins Schachenmayr SMC Boston Yarn. Color: #121 Neon Yellow #122 Neon Orange. 60 Yards/skein. Schachenmayr Nomotta Microsport weight microfiber yarn. Color: Lemon (# 00021) - light soft baby yellow, see photo 1 for accurate color. 1.75 oz (50 grams), 159 yards each. 100% microfiber acrylic. 2 Skeins Schachenmayr Boston Yarn "#2 Cream"
NEW 2 Skeins Schachenmayr Boston Yarn. Color: #2 Cream. 60 Yards/skein. 4 Skeins Schachenmayr Boston Style Yarn "#599 Black/Tan"
NEW 4 Skeins Schachenmayr Boston Style Yarn. Color: #599 Black/Tan. 66 Yards/skein. 2 Skeins Schachenmayr Lova Fan Yarn "#86 Black/Gold, #88 Purple/Gold"
NEW 2 Skeins Schachenmayr Lova Fan Yarn. Color: #86 Black/Gold, #88 Purple/Gold. 87 Yards/Skein. 2 Skeins Schachenmayr Lova Fan Yarn "#80 Red/White, #90 Gold/Dark Green"
NEW 2 Skeins Schachenmayr Lova Fan Yarn. Color: #80 Red/White, #90 Gold/Dark Green. 67% Acrylic 30% Wool 3% Polyamide. These are chunky 100 gram skeins! One ball of this reflective bulky yarn will make a hat - and the pattern is on the ball band! Knits on US 10.75 (7mm) - US 11 (8mm) needles for any bulky weight pattern. Schachenmayr nomotta Toy #26 Pink Green Blue Yellow Cotton Blend Braided Chainette 12-Ply Yarn 50 Gram, 65 Yards Machine Washable. Quick to knit but light in feel! 48% Acrylic. Unit weight. Care: Machine wash, dry flat. 2 Skeins Do Not Have Labels Have Not Been used. Strick 22 DK. Light Weight Yarn Between 1.6oz And 1.7oz per skein. 3-4 Crochet & Knitting Milward. But this yarn does more than catch the eye – it reflects light in the dark! A reflective strand is spun around the easy-wash acrylic core, making it ideal for knit or crochet projects that stand out in dark and gloomy weather. 2 Skeins Schachenmayr SMC Boston Yarn "#101 Off White"
NEW 2 Skeins Schachenmayr SMC Boston Yarn. Color: #101 Off White. 60 Yards/skein. 1 x LG 150gr Schachenmayr Lumio #00070 Neon Green Light Reflecting Yarn Super Bulky. 1x LG 150gr Schachenmayr Lumio #00010 Chestnut Light Reflecting Yarn Super Bulky. I'm more than happy to help. Any Conditions, Flaws or Defects that I see will be noted and photographed. 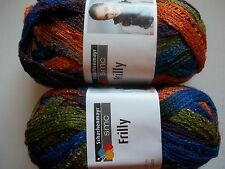 x1 Schachenmayr Frilly Yarn #00092 Aqua Mix DISCONTINUED!! Knits up beautifully! Fun and trendy! Very basic knit/crochet skills required. Price is per skein. THIS LINE IS DISCONTINUED, so get it while you can, because once it's gone, it's GONE! They apply unless otherwise stated. Brand new yarn. Great fall colors! 5 Skeins Schachenmayr SMC Boston Yarn "#30 Red #35 Rose #66 Aqua #151 Royal Blu"
NEW 5 Skeins Schachenmayr SMC Boston Yarn. Color: #30 Red #35 Rose #66 Aqua #151 Royal Blue, Charcoal. 70% Acrylic 30% Wool. A thick strand of fiber is plyed on one side of the yarn to add a whole lot of texture and interest to your next ruffle scarf! Made in China. This pretty ball of yarn will enhance your beautiful creations. 5 Skeins Schachenmayr SMC Boston Yarn "#136 Hot Pink"
NEW 5 Skeins Schachenmayr SMC Boston Yarn. Color: #136 Hot Pink. 60 Yards/skein. A lot of 4 skeins beige color (00005) of Network lace yarn. 75% acrylic, 25% wool. 3.53 oz or 100 g.
A lot of 4 skeins Burgundy Heather color (00032) of Network knitting lace yarn. 75% acrylic, 25% wool. 3.53 oz or 100 g.
5 skeins of Schachenmayr Nomotta Vision yarn. 40% Cotton/ 40% Acrylic / 20% Polymide. Schachenmayr nomotta Toy #33 Pink Blue Yellow Cotton Blend Braided Chainette 12-Ply Yarn 50 Gram, 65 Yards Machine Washable. Quick to knit but light in feel! 48% Acrylic. Unit weight. Care: Machine wash, dry flat.